I don’t think I’d be inaccurate in thinking that this site’s readers tend to interact with more than one computer in their daily quest to do whatever they do. Just looking through the obligatory “What’s in your rig” forum thread turns up a lot of people who have a desktop and laptop, some who have gone even further. A couple of people are doing the cross-OS thing (I know Peter runs a windows laptop alongside his shiny Mac gear), and this kind of behaviour is only going to increase as computers drop further in price and turn up on supermarket shelves. Having lots of computers scattered around is great: When the current one is maxed out with rendering, ripping, burning… finding alien messages in pi, then you can grab the next one along and work on something else rather than staring at that hourglass or spinny ball thing. Of course if you don’t actually have to move somewhere else to control that other machine, then you’re combining the best parts of efficiency and laziness and I’m very proud. You could pick up a hardware KVM switch but this limits you by the number of ports and cable reach. You could use a virtual client such as VNC, Apple Remote Desktop or Windows remote desktop, but running these programs loads the remote system’s screen into your current one, losing precious screen real estate. Redirecting the mouse and keyboard is as simple as moving the mouse off the edge of your screen. Synergy also merges the clipboards of all the systems into one, allowing cut-and-paste between systems. 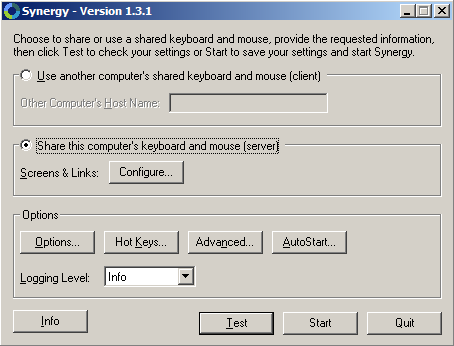 Synergy is open-source and has binaries available for OSX, Win32 and unix flavours.